What is up, everybody? 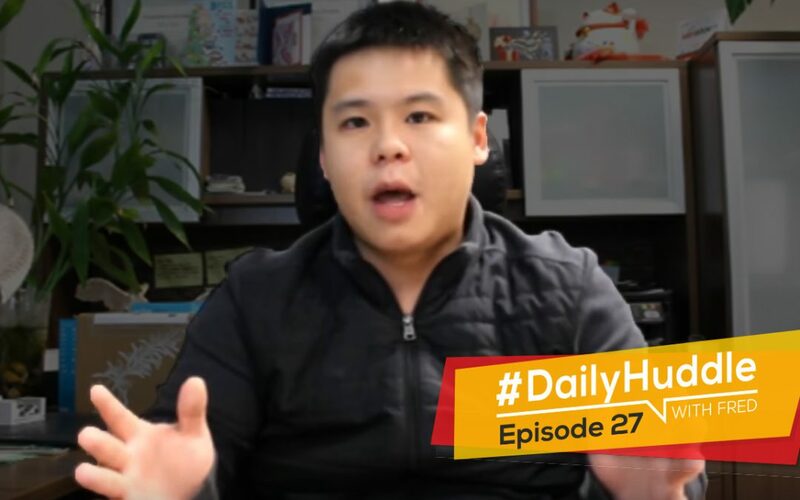 Fred Lam here and welcome to our daily huddle episode number 27. Today, I came on a little bit later than normal. Right now it’s actually 9:30 PM Pacific time and I was actually caught up on doing some work and I was able to come on earlier because on Thursdays I usually come on at 9 PM so I’m 30 minutes late. I would expect that I get a different crowd of people watching our live video. Tell me in the comment box in Facebook or YouTube if this is your first time joining us and if where you guys are from watching my live video right now or our daily huddle episode number 27. I know for a fact that this is definitely a very, very odd hour for me to actually come on live. I understand that but we’ll see if we actually get some people maybe from UK or the other side of the world who have a completely different time zone. Let’s see how many people are actually on at this time. Anyway, before I go into my daily huddle to answer five burning questions, I want to make an announcement. Yesterday, I announced a new winner of our trip to Vancouver where I’ll be paying for the flight and hotel plus a one day of consultation with me. The person actually watched my live video, submitted the email and gave me the order receipt. He is officially the winner of our trip to Vancouver and meet Fred Lam. I want everybody to congratulate that person and his name is Jonah Chang. It’s an Asian name out of my surprise. It’s Jonah J. Chang. He’s actually from California so I am very eager to meet you. I am going to personally email you or my assistant will and we’re going to coordinate and figure out the best time for you and I to actually have all this set up. We are also going to shoot some video so make sure just like me, get your hair cut done, do some facial or whatever because we’re going to come on live. I’m having a lot of people right now. Shane from New Zealand, Sammuel from New York City. I have Pang Tang Ong from Malaysia, Elaine from Australia. Moving forward let me get the five questions up and I am going to answer them. One of them is going to basically talk about one of the topics that I actually put in the description which is about look-alike ads why it’s not working and I’ll go in detail when that question actually comes up for our daily huddle. [0:04:55] Question 1: To work with Amazon and eBay, Having PayPal account and working through that is required, since Turkey does't work with PayPal ,is there any other way to that? just with having credit card. ?? Hello, I wanna start my own business with small steps forward. 1. so I decided to do drop shipping. in this way it’s not necessary I be worried about shipping items to customer and I can get my selling commission. but to work with Amazon and eBay, Having PayPal account and working through that is required, since Turkey does’t work with PayPal ,is there any other way to that? just with having credit card. ?? 2. if I wanna have my own website and sell for example cosmetic on that , how can I do it without having the items, I mean , I just advertise the items which i found from different source and I determine price and information for each option without link them to the origin source, but I want automatically the order which is done from my web page goes to original source and they be responsible about shipping and the difference of price that I provide on my web goes to my account. That’s your first question and to answer it right away is that if you are focusing on drop shipping then you do not want to actually touch Amazon and eBay yet. 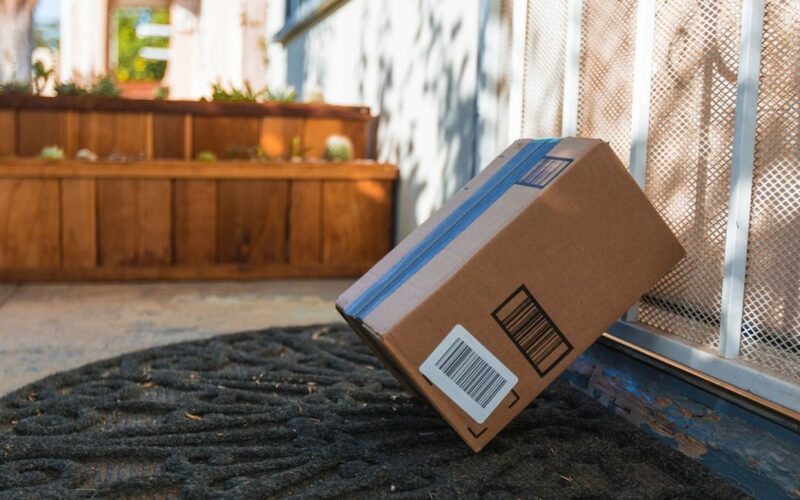 Amazon and eBay do require you to actually have an investment in inventory and the operation of the business is very, very different. Focus on one business at a time. 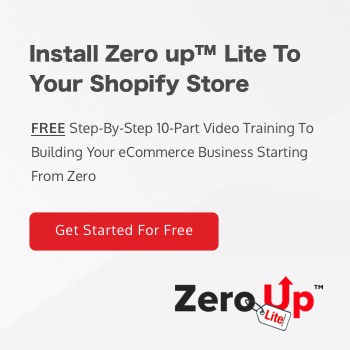 If you’re starting out and you’re doing drop shipping just go drop shipping, go set up a Shopify store. I have a 10-part video training series that is absolutely free that you can download and basically start building your business. In regards to you not able to work with Paypal because you are in Turkey, first of all I am not the right person to answer that question because I am not from Turkey. 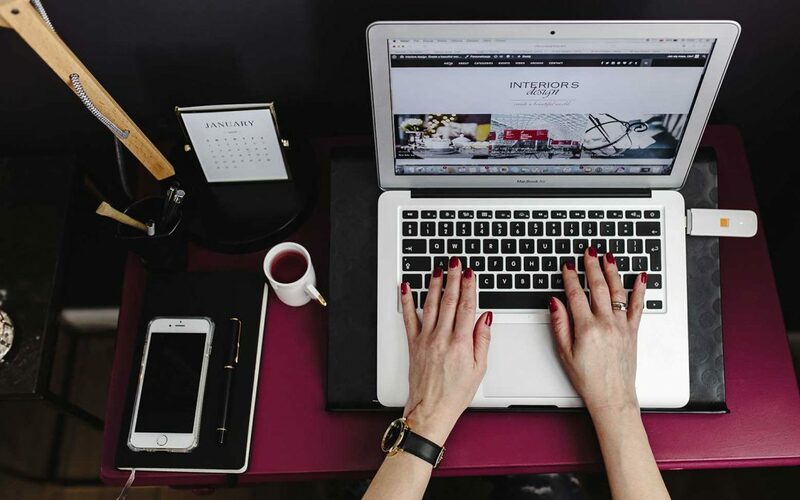 I know that there are some challenges for any international people who are watching this or want to build a drop shipping store because payment is actually a very important thing that you need to get resolved so that you can collect money from your customers. The best bet form what I know is 2checkout.com. 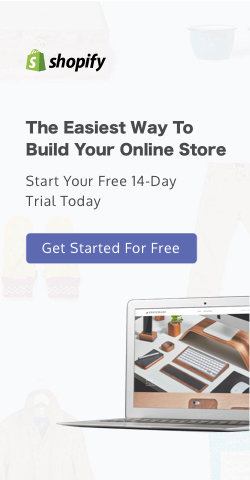 The other way that I will highly encourage you to start doing is to go to Shopify.com hit the live chat button and ask the live agent, “I’m from Turkey. I want to create a Shopify store. What is my solution for credit card processing?” And I would tell you, they would actually have a better response than me giving it to you because they may have dealt with a lot of people from Turkey and they know the ones to recommend and you simply go from there. That solved your problem. Your second question is if I want to have my own website and sell for example cosmetic on that, how can I do it without having the items, I mean, I just advertise the items which I found from different source and I determine price and information for each option without link them to the origin source, but I want automatically order which is done from my web page goes to original source and they be responsible about shipping and the difference of price that I provide on my web goes to my account. Sahar, here’s a big, big pitfall that you’re going into. Cosmetic it’s a very superbly crazy, dangerous part to be in since it is kind of like a consumable because people are putting it on their faces. There are going to be more liability when it comes to these consumer goods because they are classified as consumable even though we are not ingesting it but still we are putting it in our faces. There are strict regulations when it comes to cosmetic. First of all you have to make sure that the sources that you are getting these cosmetics have all the certification in place and there’s no problem with it and the company has been existing for quite some time. For those of you who are watching this right now, again when it comes to processing for cosmetics it is going to be harder because of liabilities. I just want to give you heads up before you actually start encountering problems and not being able to move forward. If you are absolutely new to all these, I would suggest that you just sell tangible goods right out the gate and basically gain your knowledge from there. Now, it doesn’t mean that you can’t sell cosmetics, absolutely you can and I know a lot of people make a lot of money selling cosmetics. However, when it comes to cosmetics it’s very rare to actually have drop shipping with cosmetics. Majority of people that I know, the things that I have seen, businesses that are doing well in cosmetics they actually private label products, invest into inventory, build sales funnel and all those other stuff. I am just being upfront and honest. It doesn’t mean that there aren’t drop shippers on cosmetics and I am pretty sure there are but you just have to make sure the source is right before you figure out the automation and the other side of things. Obviously if you want to automate the tangible goods out of Aliexpress then you can look into Zero Up because we automate the process. But if you are looking for cosmetics, I would say you may have to figure something out. It’s not going to be automatic instead it’s going to be semi-automatic so you are going to export order, send it through a CSV to your supplier and they ship the product out on your behalf. That’s what you have to do. It just works but it just works in a different manner and fashion. Anyway, I’m just bringing that up to share that with you guys. [0:10:42] Question 2: Any other alternative cheaper way for doing Facebook Marketing ? The second question is by Nicholas Chin. that means I need to pay a total of RM8292 per annum (or about RM700/mth) for running a non guaranteed success online biz which is a bit burden for me. Any other alternative cheaper way for doing Facebook Marketing ? Nicholas I am going to have a moment of truth with you right now. For those of you who are watching right now, this is a very important message for you and you may think that I’m going to be a complete a**hole but I’m just going to be honest with you. Number 1 you can’t make money if you don’t invest your money. Very simple stuff. Why do billionaires make more money every single year? It’s because they invest their money to make more money. That is the law when it comes to money. Let’s be honest. It doesn’t have to be your money like Rich Dad taught you. You can actually use other people’s money, OPM. You can use other people’s money to make more money and you make the margin right in between but the truth is if you don’t invest into your business you will not have a business and I’m just going to be flat out and honest with you. The second thing that I see a big problem based on your message or based on your question that you have for me is the following. You said, “Well right now if I spend $5 a day”, you multiply it by 30 days and multiply it by 12 months to get that number. That is already a super different mindset, a wrong mentality to have because you are positioning yourself to fail. Let me repeat that if you did the calculation right now saying, “Fred, if I have to spend $5 a day and I’m going spend it in 365 days. This is the X amount of dollar that I’m going to basically pay in just for my ads.” Then you’re setting up yourself to fail because you are already subconsciously saying to yourself this is not going to work. What if you have a day of ads running and you start generating a sale a day? So, basically that means that you are breaking even throughout the 365 days. That means also that you don’t need to invest a single penny because you obviously make your money back. With your mentality you’re telling me that if I have to spend $5 a day for 365 days in a row and you can’t justify that I’m telling you, you are setting up yourself to fail. I hate to say this to you and I know that I may sound a little bit mean, rude or an a**hole but this is the real truth. You can’t basically expect money falling down from the sky. Right now when you’re working a 9 to 5 job you’re trading your time for money. In order for you to build a business you have to invest not only in your business but invest in yourself to gain knowledge. And you already position yourself on thinking, “Well at the end of the day this is not going to work. I am not guaranteed a success.” Yes that’s true you’re not guaranteed a success but at the end of the day you are setting yourself for failure already. If you are already in that mindset, there are two options for you right now. Number 1 I would actually ask you to go back to work on your 9 to 5 rat race. I’m just being honest with you. Don’t waste your time because you are already setting up yourself into basically not going to make it work. Number 2 is that you have to shift your paradigm just like Bob Proctor teaches. You have to shift your paradigm and look at it from a different perspective. It’s kind of like when people say, “I can’t do it.” Well the other side of the question is “How can I do it?” That’s what you have to shift your mind set in. And at the end of the day, yes business is business or business models that work and the things that I teach absolutely work but you need to know that ultimately if you say, ” Well I’m just going to think that this is not going to work and I am doubting it and all those other stuff,” and you are not pushing forward then there’s no point. You are just forcing things to happen. And if you are forcing things to happen but your subconscious mind is already telling you NO, it’s like you’re not going to succeed. At the end of the day when it comes to business, yes like I said earlier there are systems, processes and things in place but the truth is it is a personal development process because you need to have separate mindset. You need to build on your personal growth in order for your business to grow. That’s why at the end of the day top billionaires, top CEOs around the world they would still have coaches, mentors and pay for other programs that are a lot more expensive or get into masterminds that cost them at least six figures a year so that they can keep growing not just their business but basically growing their minds. You need to have that shift in focus when you are becoming an entrepreneur. I’m not sure if that’s the answer that you’re looking for Nicholas but I’m just coming from a perspective of being super upfront and honest with you and I don’t want you to waste your time if you are in that mentality and you can’t get out that mentality. I do have to say I’m not blaming you for having that mindset only because obviously in Malaysia it is classified as the Asian culture. You are in Asia, I was born in Asia so I kind of know from great grand pa to grand pa to mom and dad on how they tell us the society is the way it is. I know it’s very hard to get out of that but you have to get out of that zone if you want to succeed. I know that this is really out of the realm. I am ranting a lot more than I am. Put in the love into the comment box if you guys love these pep talks. For me personally when I am working on right now growing my business to a new level, like listen I have to work on myself. I have to take on challenges and take on things that I never actually have dealt with before and I’m just in the process of doing it. Also, I’m just sharing those with you that when I reflect back in my career, you can say that I’m super successful but I can see that there are people who are more successful than I am and I’m working towards to be more successful. Through that time I have really transitioned myself and saw my personal side grow, how my mind has shift, how I look at or visualize things, how I look at from different lenses in the business world and in the society at the same time. It seems that you guys love this pep talk. Research on YouTube said, “Truth is everyone loves and wants to be an entrepreneur but not everyone has the attitude and mindset so not everyone can be an entrepreneur. This is right research and I’ll be honest with you. It is a mindset thing. If tomorrow you won the lottery for $5 million and you decide to get a franchise from McDonald’s but if you don’t change your perspective and your work on your mind set you can easily lose your McDonald’s license and also lose that $5 million because you did not groom your mind to become an entrepreneur. Right now we’re living in a golden age of entrepreneurship. I’m not talking about just the system; I’m talking about basically the process. I’m talking about what is available right now in the internet that will help you shift your mind set. I’m not talking about motivation videos right now. I’m more talking about practicality and practical things that can make your mind shift. You have to make that shift because we were born and raised to work in a 9 to 5 job. Anyway, I’m just sharing all these with you in ranting. I’m here to tell you in advance that you cannot have that mindset or else you’re setting up yourself for failure. Nicholas I don’t know if you’re looking for that answer and I know that you are maybe a little bit upset with me because I’m being super honest with you but I’m just telling you in advance. There are two options and you have to figure it out. [0:21:12] Question 3: What do you suggest the problem would be with my purchase LLA? I have over 400 purchases on this one product but after letting the LLA ad run for 45 days the stats are really low. Only 2 sales and lower (by a lot) CTR than the original ad. Original ads get between 47% but the LLA is like 1.5 CTR. Almost like it's a brand new pixel/store. What do you suggest the problem would be with my purchase LLA? I have over 400 purchases on this one product but after letting the LLA ad run for 4-5 days the stats are really low. Only 2 sales and lower(by a lot) CTR than the original ad. Original ads get between 4-7% but the LLA is like 1.5 CTR. Almost like it’s a brand new pixel/store. It’s a really great question. With 400 purchases you’re not guaranteeing for basically having your look alikes to work. I’m not sure what product you’re selling and if those 400 purchases actually came from that same product and if you have other pixel data when you are creating your look alike audience. Let me share with you some reasons why look alike audience may not work. I think that will be easier because what you gave me is not enough data for me to give you a firm answer but I’m just going to give you case studies. If you have 400 purchases on one product but in your store you may have sold a lot of other products. Let’s say you have sold 600 products and you created a look alike based on the purchase pixel then at the end of the day you are basically going to confuse the look alike audience only because it is not just going for that 400 products; it is also going for that 600 orders that you have, so it include those two and yours products and it mixed things up and it’s not going to be as great. That’s reason number one. I’m not sure where you are at. Now, let’s assume that all 400 products came from the same product and you create a custom conversion based on that one particular product to create your look a likes or are you adding it in interest targeting with your look a likes or not? That’s a very important question because at 400 purchases it is very rare for the look alike to run by itself. Again, it’s different depending on what product you sell but you have to test your look alike first with the interest targeting to see if it works great. You have to test a broader interest targeting like in the millions and overlay with your look alike audience to see if it works. Now, if that works then that’s when you transition into running your look a likes alone without any interest targeting. However, you still have to look one piece of element which is who are your actual customers in terms of their demographic that are actually buying from you. And you’ll be surprised that look alike is so strong in this technology that if you have been getting all your sales from 45 plus men and when you run your look alike you’ll see that your look alike pixel is really geared towards 45 plus men so you want to eliminate all the age range and just go after 45 plus look alike pixel. That’s how it really works. Another reasoning maybe is because you don’t have enough data yet. 400 may not be the right number for your product. You have to wait until you have 500 orders and test it again. So, you have to test different components and aspect of things. These are the reasons why look alike may not work. These are the things that will trouble shoot and drill down and actually take a look. These are the things that you have to basically look into and figure out from there. I hope that helped you out Sean. [0:25:07] Question 4: 1- can i mix many products in my website through many affiliate website ? 2-i Will Focus to advertise and bring traffic through FaceBook what ir will be the strategy ? 1- can i mix many products in my website through many affiliate website? The answer is technically yes you can. Let me actually look into before I give you feedback. 2-i Will Focus to advertise and bring traffic through FaceBook what ir will be the strategy ? Here’s the deal, first of all you have to basically justify and see if your commission is going to be great enough to actually run ads. Amazon affiliate, they are great. The conversion rate is high because it’s Amazon but the margin is pretty low. You won’t really make a lot of sales with that. That’s number one. Number two is I’m not sure what your portal is for the physical product area that you’re trying to sell it at. Again, do you have enough margin and enough commission to pay for ads? Here’s the truth when it comes to health and fitness, the CPM and the ads spend are going to be super expensive. Health and fitness, weight loss recipes those markets are superbly competitive, so I’m going to bring that out to you. Before I talk about strategy, let’s say that I’m getting good commission that is out of the way, that is fine. I don’t use woocommerce. I cannot comment on that because I want to use Shopify. I know that Shopify is pretty hard to upload affiliate products. That’s a fact that I know about. Anyway, when talking about strategy one thing that you need to keep in mind when you are running an affiliate marketing business is that you are technically building another person’s business. You are basically not left with any adset. You’re the bridge from traffic bridging on your website to an affiliate offer and you make the commission in between and hoping that that commission is going to pay off your ads and making your slim margin run in between. The real goal and the key for success for affiliate marketing are acquiring the followers or the customers’ email address. Let me repeat that. The key to success for affiliate marketing is for you to acquire their email address. There obviously is another form that you go after which is Facebook messenger which is like the next hot thing right now. You need to make sure to have a way to build the ad sets of your own business because what’s going to happen is that you are using affiliate marketing to be a stepping stone into something bigger. Let me explain this a little bit further. If I were you, here’s what I would do. You need to position yourself in the health and fitness space to be the health and fitness guy. That’s not very important. I see a lot of people that want to crack into the health and fitness space but they are not a health and fitness guy or girl. That is a big warning bell. Your consumers or followers can smell it if you are basically not doing that. It doesn’t give you the ability to create a relationship and rapport with your audience which basically it is not building a business. It is building a short term quick solution if you are able to make that margin right in between. My strategy to you if you are a health and fitness guy get on camera, put out content just like what I’m doing right now. Create an eBook or training video series that people can actually use and people can get some kind of result or people can go through your program and go “Holly molly, I love seeing this guy. I want to learn more from Ahmed.” That’s what you have to do. And then create an opt-in page to give away either your free 10-part training series or whatever or your eBook that teaches people how to become fit, how to become healthy and all those other stuff. You have to create an opt-in page, build a rapport, give away that training, eBook or whatever you’re giving away to attract to give their email address, build a rapport and start selling them right inside. You can still sell directly on an affiliate offer going to a product page inside woocommerce. What you have to do is to have java script pop up; don’t do exe intent because Facebook absolutely hates it. You have to do those java script pop ups kind of Wilio or optimonster so that you can basically offer something away for free so even if the person is not going to buy your product, you still have an opportunity to acquire their email address and work through with them through emails. That’s the best strategy that I actually want to share with you. Don’t worry about the traffic side for now. You have to build your foundation first. Listen, for me all my teachings, everything that I talk about, all the content that I give away—I’m not here to give you short-term solution. I’m trying to basically pivot and to show, guide and educate you how to build a long-term sustainable business. At times there are strategies that are for short-term gain. But even for a short-term gain you still want to have a long play. That’s why yes there’s a little bit more grunt work to be involved but if you want a higher chance of success and you are looking for this in the real entrepreneurship world and really want to build a business, this is the right way to do it. [0:32:45] Question 5: Is it ok to buy the AliExpress Plugin on Shopify to use as a backup for when I'm having issues with ZeroUp loading products? The answer is no. The reason why I’m saying that Janice is because the Aliexpress plug in may interfere with ours. If you’re having trouble with your chrome extension, the version that we have for Zero Up, double check to see if there is any updates make sure it is fully updated. It doesn’t work on the phone; it’s only working on desk top. That’s really it for our daily huddle today. I know that the time is definitely a lot different than other times. I got Islamic lectures on YouTube and say, “Hi, I’m a new subscriber.” Awesome, awesome, awesome. I am just seeing some very interesting comments coming in on YouTube which is great. I’m providing as much value as I can to every single one of you. Out of curiosity, do you guys like pep talks? I’m debating if I should actually do some like entrepreneur rants whatever that I did with Nicholas earlier today in my YouTube channel to just share the real perspective in the real life of an entrepreneur. I think it is needed because the mindset side is very, very important. Put in a ME into the comment box on Facebook and YouTube if you guys love something like that. I can look into it. If you are watching the replay let me know right below in the comment section tell me if you guys love me to do some pep talking, if you love it or hate it just give me your feedback. I will definitely take a look and consider basically spending some time on doing that. Anyway, that’s it for today’s daily huddle. Again we’re having our daily huddle tomorrow which is Friday. If you guys are on YouTube make sure you subscribe to my channel and if you are on Facebook make sure you actually hit the like button of my page. If you are on YouTube, here’s the most important thing; I think that it is an update, you have to turn on notification when you subscribe so that each time I come on live for our daily huddle it just tells you right away, so you don’t miss a single episode. Other than that comment right below on Facebook and YouTube and tell me what you guys think about today’s daily huddle. I appreciate any feedback. I love to hear from you guys and it actually helps me to figure out if I’m giving the right content away. I’m basically sharing the right knowledge and you guys are basically learning and being inspired by whatever I’m saying. I look forward on seeing you guys tomorrow for our daily huddle episode 28. Bye now.